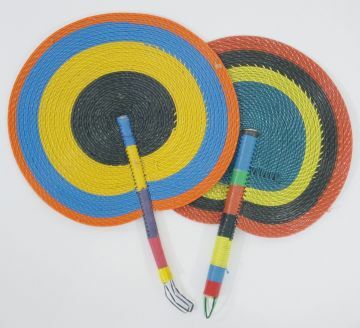 This has been one of the hottest summers for the last decade and the good old fashioned hand fan has been a god send! The weather has been so humid and hot that on my handy silk fan has been my most important 'must have' accessory in my bag. Not only is a silk fan unbeatable at quickly cooling you down but it looks beautiful too! They can be found in an infinite amount of designs and colours so you can either get one that blends in with your outfit or it can be a statement piece to top off any image! One wasn't enough for me, I had to have the green, the red and the white one! I have fallen so in love with these that I decided to do some research and learn more about them. 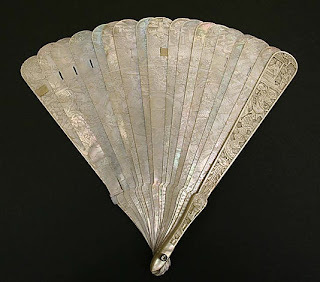 Hand fans have been around for as long as history can tell and I think it's likely that they were being used in the stone age. 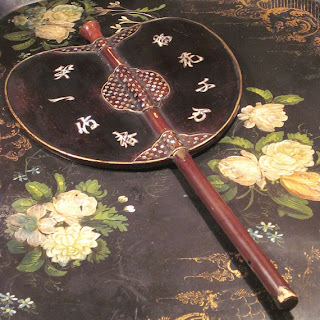 I am making this assumption based on two facts, firstly that the mechanism of a folding fan closely resembles that of a birds wing, and that the Chinese character for fan is derived from a pictogram of feathers beneath a roof. It seems a logical conclusion therefore that the very first fans were simply dismembered bird wings. 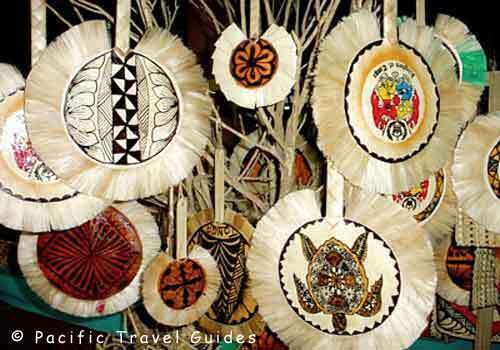 They have become a part of religious ceremonies all over the world to aid with the use of incense. They became a status symbol for the aristocracy in many countries as they represented luxury. They also represented traveling and exploration and even slavery and servitude. Although they may have been a practical solution to the problems faced by paleontological humans living in a hot climate, the fan may also have served as a vital tool in meat curing. Before the domestication of fire some 40,000 years ago there would have been very few options for curing meat. Salt was one method which may have been employed the other was drying. Meat and would have been cut into strips and hung over the branches on trees in the hot sun of the African savanna for drying. In a humid climate creating a breeze would have been an essential part of the process and a good way to keep flies away. After the discovery of fire, the fan may have been discovered as a useful tool for encouraging an ember to ignite. The Samurai's had 3 types of weapon fan used in warfare. One had an iron handle which could knock out an opponent, another had a concealed blade within the handle and the third was a full metal folding fan which was employed as a shield to fend off arrows. They were also used for signalling on the battlefield. 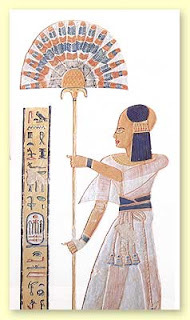 The Romans and ancient Egyptians were particularly keen to keep a cool environment and their slave culture would have employed many fan bearers. 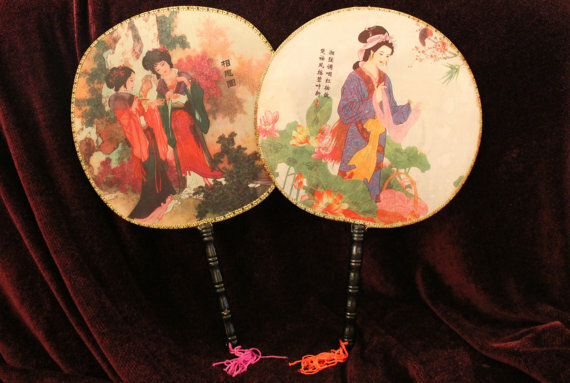 The folding fan quickly became a status symbol due to it's intricate craftsmanship, illustrations of women holding their precious accessory can be seen on antiquities as old as the ancient Greeks. 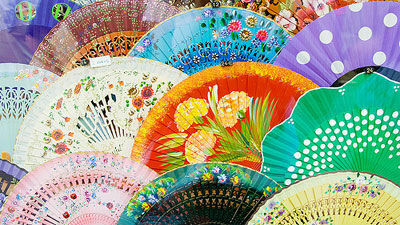 In more recent history the fan has become a much more decorative item and a desirable status symbol. It has become associated with the arts and this has progressed into a dancing fan. 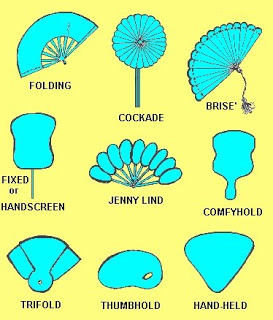 There are several styles of fan which can be grouped into two basic categories, folding and rigid. 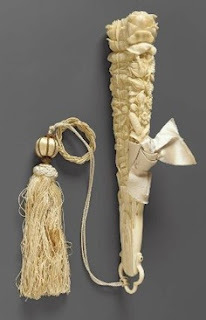 As well as ornately carved wooden handles they were also made from ivory, bone, mother of pearl and real feather. The rigid fan comes in a huge variety of ornate shapes, each one typical of the time and place it was made. It was popular to be made of a paint-able substance in the Orient due to there love of calligraphy and brushed on decorations. 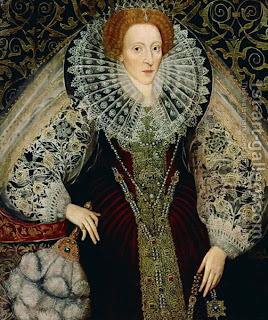 Silk, paper etc were the material of choice. 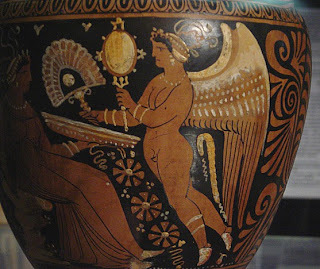 However in countries that were more sculptural in their artifacts the use of multiple natural materials to create a striking design was more common place. fans were woven out of dyed reeds and grasses. 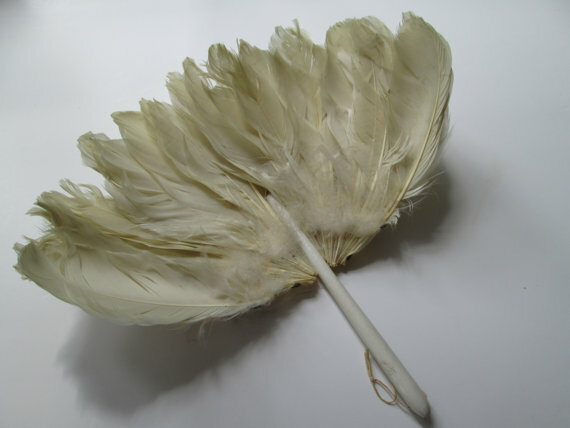 In South America the fan was equally popular as in the rest of the world, here is a beautiful example of a Maccaw feather fan.